Good morning! This was one of our projects at my last team meeting! Uses so many fun new products! We colored the back side of the vellum, then adhered that to Whisper White cadstock! What a great effect, don't you think? WOW! Isn't the new catalog wonderful? So many fun new items! Stampin' Up! has made several videos, highlighting some of the new products! I'll be sharing those here on my blog! If you have any questions after viewing, please let me know! A warning -- you're going to want all the products after watching these great videos!! 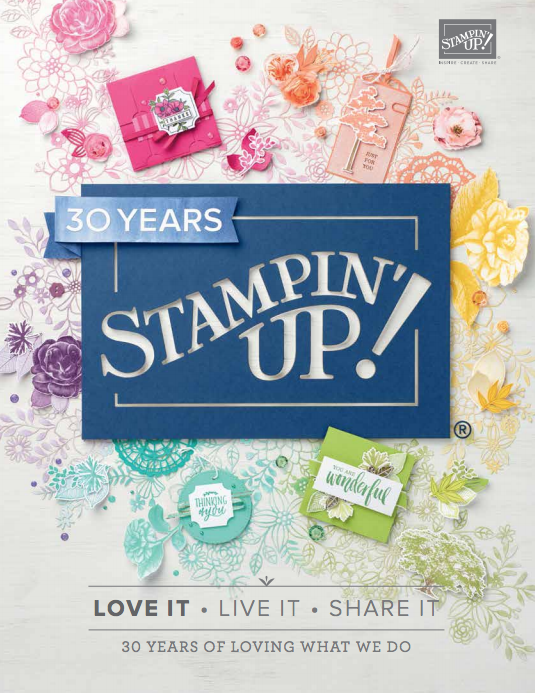 It's time to celebrate 30 years of creativity with Stampin' Up! The party starts at noon mountain time on June 1st. The artists and designers at Stampin' Up! have been really busy this year creating what may be the very best catalog yet. I'm especially excited about the release of the Stamparatus and the luscious new colors - I think you will be WOW'd! You have received this email because you have subscribed to my newsletter list, purchased products from me, or attended an event I hosted. If you no longer wish to receive emails please unsubscribe using the link below.